Your home doesn’t have to be unsanitary for you to have an infestation of fruit flies. The flies are initially attracted to the kitchen, from the microorganisms associated with spoiled vegetables and fruits, rather than the fruit itself. They are also attracted to moisture, which is why you might have fruit flies in your bathroom. It may be difficult to get rid of these pesky insects. They don’t have a long life cycle, but they reproduce very quickly. They can easily infest your whole house, including the bathroom. They are drawn to damp, wet places, which makes the bathroom attractive. To rid your home of fruit flies, get rid of wet sponges, rags and mops. Make sure the towels and unused washcloths in your bathroom are dry. Replace old mops and rags. Drains and sinks make an excellent breeding ground for fruit flies, so they should be cleaned thoroughly. To avoid infestation in the first place, maintain a clean and healthy house. This is important in all rooms, not just the kitchen and bathroom. Fruit flies that originate in the kitchen won’t take long to find the breeding places in your bathroom. Inspect the drainage pipes in your bathroom. Anywhere there is a film of moisture and humidity is a perfect breeding ground. Fruit flies lay their eggs in the sludge found in drains and they develop quickly into their larval stage. Cleaning drains will eliminate the breeding ground. Use duct tape to check pipes. Place a piece over the top of a drain. If it yields fruit flies sticking to it, that means they are present in your pipes. If you have any drain pipes that are broken, flies can get into them more easily. Tape off any cracks you find. Repair them as soon as you can. If you have broken tiles, allowing water to seep into your walls or floor, this will also provide an attractive breeding ground for fruit flies in the bathroom. Make the repairs promptly. The drain is usually the area of the bathroom that may become infested with these annoying little flies. They may be seen around the sink or shower drains. Where this occurs, you’ll want to treat the room against fruit flies. They thrive in areas with organic matter and moisture. In order for the fruit flies to thrive in your bathroom, it must offer them a moist and inviting environment. There must be some source of microorganisms, since those are what they feed on. Once you get rid of slime found in your sink and shower drains, it should take care of the whole problem. If they can’t breed, fruit flies will be unlikely to infest the room. Once you rid the bathroom of its breeding grounds, be sure to set traps for adult flies, to make sure you get all of them. Although fruit fly infestation is a nasty problem to deal with, a simple cleaning of the drains is a good start in eliminating them. You also need to make sure that you don’t let wet towels and washcloths pile up in your bathroom. Keeping the room at its cleanest, and cleaning the drain pipes periodically, will keep the fruit flies away. In many bathroom infestations, there could be a broken pipe or sewer joint where the flies are laying their eggs. This is the place where the flies’ larval stage will be feeding, if there is anything for them to consume. Have the drains mechanically cleaned. This will remove the sludge that the flies like to lay eggs in. Clean the drains so that there is no trapped debris to be found. Bleach is a good cleaner, but it won’t eliminate larvae on its own. Determine the original source of the flies, and purge them in that room, too. The kitchen is the logical place to look, due to the presence of garbage that has been discarded after meals. Replace all broken drains. Be sure that they don’t have any sludge in them. Hot water is helpful in breaking down the sludge. Any sink in your home can conceivably be a home for fruit flies. This includes kitchen, bathroom and laundry room sinks and any other sinks in your house. 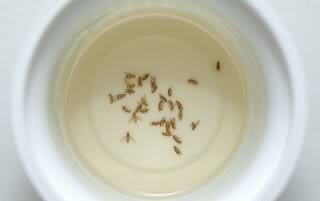 In order to keep fruit flies from breeding in your kitchen sink, make sure any dishes you leave there are clean. Wine or juice glasses are quite attractive to fruit flies. Ensure that they are rinsed, along with plates that might otherwise have food residue on them. If you’re not fully washing your dishes right after you use them, rinse them off well and place them in the dishwasher. As far as fruit flies in bathroom sinks are concerned, their main attraction is dampness. If your sink drips, this provides them with an environment they prefer. Fix any leaks, and use traps to get rid of existing infestations. These pesky flies can be anywhere in your house. This includes drains or garbage inside or outside the house, as well as sitting water in gardens, and even water in pool areas. Don’t give fruit flies an environment they seek for breeding. Wash all fruits and veggies when you bring them in from the grocery or produce market, and keep your house clean and dry.